In this paper, a novel framework for optimizing the coexistence between LTE and WiFi over unlicensed bands, is proposed. 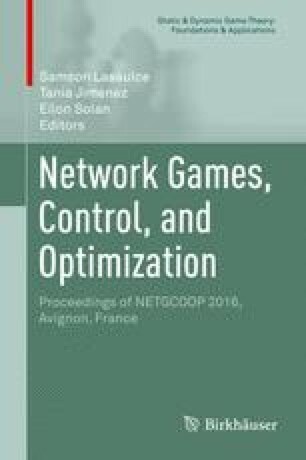 The problem is modeled using the framework of multi-game theory in which the WiFi users (WUs) are considered as leaders and the small base stations (SBSs) as followers. This multi-game framework encompasses two games of different types. In this regard, the competition between the WUs to access the unlicensed channels is formulated as a one-sided matching game while the power allocation problem of the SBSs is formulated as a noncooperative game. In this multi-game, the SBSs anticipate the channel allocation on the WiFi network and adapt their strategies accordingly while the WUs predict the power allocation of the SBSs. For the latter, the existence of a unique Debreu equilibrium is proved while for the matching game the existence of core stable outcome is shown and a decentralized algorithm that converges to the stable outcome is proposed. This research was supported by ERC Starting Grant 305123 MORE (Advanced Mathematical Tools for Complex Network Engineering), the ANR project: WisePhy: Sécurité pour les communications sans fil à la couche physique, the U.S. National Science Foundation under Grants CNS-1513697, CNS-1460316 and AST-1506297.